eReaders put millions of books, magazines, newspapers and more at your fingertips. With over 1 million books, newspapers, magazines and more just waiting to be downloaded from various eBook stores, there’s certainly something you’ll love. Along with a constantly updating collection of classics and pre-eBook literature, almost every new book written is available to download making for an almost limitless library to explore. Dedicated eReaders differ from regular tablets in that they feature electronic paper screens which, unlike heavily backlit LCD and LED screens, won’t leave your eyes sore and strained after prolonged use. Also, they don’t reflect sunlight, making them the perfect for making the most of downtime, whether you’re on the train to work or relaxing by the pool on holiday. While some eReaders feature general web-browsing and social media apps, the eBook interface is typically focussed towards easy content access that makes it easy to find and search along with providing an easy jump-off point for exploring genres, authors, publishers and more. 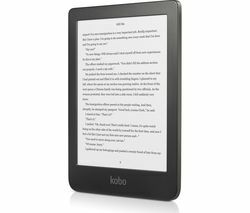 All eReaders feature built-in WiFi connectivity and direct access to their corresponding book store, meaning all you need to get started is access to a wireless internet connection. 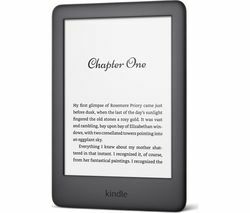 With well-loved brands including Kindle and Nook, our eReaders range is bound to feature something you’ll love.